Class sizes are increasing, but does it really matter? Two years of cuts in state support saddled the Natomas Unified School District in Sacramento, Calif. this spring with what school board president B. Teri Burns said were “horribly painful” choices: fewer teachers and larger classes, or keeping teachers but cutting athletics, counseling, after-school programs and other services. Conventional wisdom says the smaller the classes, the better the education, because teachers can pay more attention to each child. But while smaller classes are popular among parents who factor them into decisions about where to send their children to school, decades of research have found that the relationship between class size and student outcomes is murky. “The research doesn’t show that you get significantly different student outcomes when you go from a class of 25 to a class of 30,” Burns says. With state and local budgets still in flux, it’s hard to know exactly how many teachers will lose their jobs this year. However, educators and politicians alike agree that the layoffs won’t be nearly as harsh as once expected now that President Barack Obama has signed into law a $26 billion plan to preserve thousands of jobs. States will receive $10 billion specifically for saving teachers’ jobs, and though they’ll have until September 2012 to spend the money, Education Secretary Arne Duncan is urging states to use it immediately. The U.S. Department of Education had predicted that as many as 300,000 teachers and other personnel could be laid off without this new infusion of funds. The department now estimates that some 161,000 educators who had received pink slips will be heading back to school this fall, with the new money funding 16,500 positions in California, 14,500 in Texas and more than 9,000 in Florida. But even with $10 billion in additional federal funds, the current fiscal crisis is expected to reverse a decades-long trend toward smaller classes. Education statistics shows that school personnel were hired at twice the rate that student enrollment grew between 1999 and 2007. According to the National Center for Education Statistics, the average class size of U.S. elementary schools dropped from 24 pupils in 1993 to 20 in 2007. The ratio of students to teachers – bearing in mind that not all teachers work in classrooms – has fallen even faster. In the 1960s, there were about 26 students per teacher. By 2005, that ratio was about 16 students per teacher. Robynne Rose-Haymer, whose three children have attended the Natomas schools, said class-size increases in recent years have negatively affected educational quality. One child now in high school writes half as many essays as an older sibling did who graduated in 2006. Classroom aides who once helped with grading and taking attendance have already been cut. More of the “testing now is one-line answers,” with multiple-choice tests graded by machines. “You can’t get a good understanding with multiple-choice” tests in history class, Rose-Haymer said. In Chicago, plans to increase the size of elementary school classes have been dropped but high school classes will rise to 33 students this fall, up from 31 last year. New York City schools will shed 2,000 teaching positions this year through attrition – teachers who retire or leave the district without being replaced – but there won’t be other teacher layoffs, according to Anne Forte, a spokesperson for the city’s department of education. The average class size is expected to grow by one student. In addition, hundreds of classroom-aide positions will be slashed this year, on top of the 530 cut last year, but Forte said exact numbers won’t be available until principals finalize their budgets. In the early 1990s, when many states were flush with cash, policymakers championed the findings of a 1985 experiment in Tennessee. The Student/Teacher Achievement Ratio (STAR) project compared academic achievement in small classes of 13 to 17 low-income students with that of students in classes that had 22 to 25 students per teacher. The experiment found modest but lasting gains for impoverished African-American students in the much smaller classes in kindergarten and first grade. States extrapolated from those narrow findings to justify spending billions of dollars to make relatively modest cuts in class size in all schools, not just in those serving the poor. About three dozen states now fund either voluntary or mandated class-size reduction programs. In 1996, California launched the first and largest such effort, eventually providing incentives for school districts to lower class size to 20 in kindergarten through third grade at a cumulative cost of $20 billion. 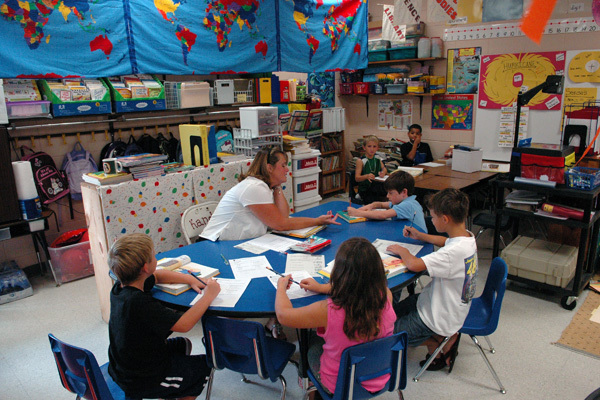 In 2002, Florida voters approved an amendment to the state constitution that reduced class size over time in all grades. The state estimates that it will cost an additional $353 million this year, on top of the $16 billion the state has spent so far on class size reduction, to meet the amendment’s requirements. In November, Florida voters will be asked to loosen those requirements to avoid massive spending cuts in other school services. The effects of these two state programs on student achievement have been extensively studied. A study released in May by the John F. Kennedy School of Government at Harvard University found that the Florida program had no effect on student achievement. Research on California’s program also showed no gains in achievement attributable to smaller classes. Michael W. Kirst, an emeritus professor at Stanford University, was part of a research team that studied the California program. He said excitement over the program resulted in school districts hiring “all sorts of teachers just off the street” who lacked any formal training. Space shortages forced schools to hold the newly created classes in hallways and closets and on auditorium stages. In some cases, two elementary classes shared a single classroom, the space divided only by a curtain. Nonetheless, Kirst said, the program was popular. “One lesson from California is that, with parents, smaller class size is overwhelmingly favorable and they don’t give a fig about the research that says this is not going to help their kids,” he said. “They intuitively believe that small class sizes will allow more individual attention to flow to their children. Therefore, they want it.” Elected school board members have a hard time resisting parental pressure for small classes, Kirst said. Dan Goldhaber, of the Center on Reinventing Public Education at the University of Washington- Bothell, says that “the effects of class-size reduction are pretty marginal,” except in the early grades for disadvantaged students. With rampant teacher layoffs, Goldhaber says, “it probably makes sense … to focus, not so much on class sizes, but on making sure that the teachers you are keeping are really effective teachers.” But seniority provisions in most teachers’ contracts do not permit that, although some districts and states are now seeking to change these provisions. The Florida chapter of the NEA is fighting efforts to scale back the class-size reduction program there, saying the amendment was approved by 60 percent of the voters. Ever since it was passed, “there’s been an effort to either repeal it or scale it back,” says Mark Pudlow of the Florida Education Association. Julie White of the Association of California School Administrators said the state has long had the largest classes in the nation, even with the massive amount of money spent to lower class size. White says it’s unclear if the 26,000 teachers in jeopardy of layoffs this summer will still lose their jobs, despite the passage of the jobs bill. Some classes still could have 40 or more students. Los Angeles Unified School District has grappled with $1.5 billion in budget cuts and nearly 3,000 teacher layoffs during the past two years. “The education community says ‘enough is enough,’ ” says White. What happens in California often influences policies nationally. And it is teachers’ unions that hold the key to how big classes become. If they don’t accept salary freezes or reduced health benefits, they’ll almost certainly see colleagues laid off and class size climb. Susan Sawyers contributed reporting. Tamara Henry is a lecturer in the Philip Merrill College of Journalism at University of Maryland and a former national education writer for USA Today. A version of this story appeared in USA Today on August 26, 2010.